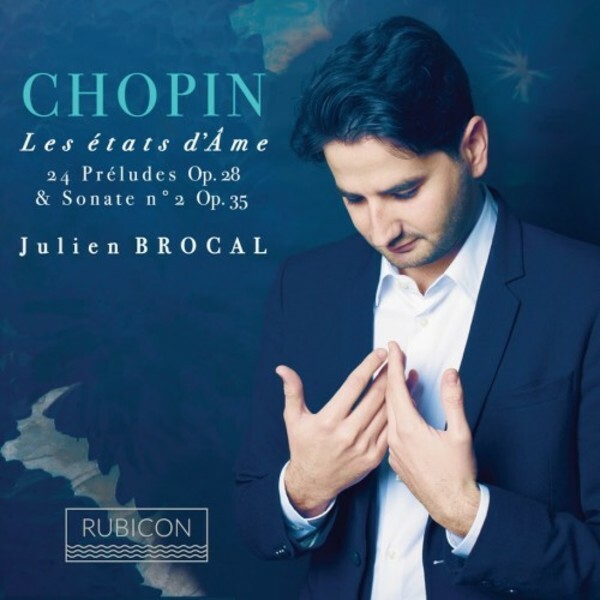 Julien Brocal was born in Arles, France in 1987 and began piano lessons at the age of 5, and by 7 was performing on stage. In 2013 he was tutored by Maria João Pires at Cité de la Musique in Paris, and later she invited him to develop his projects and studies at the Queen Elisabeth Musical Chapel, and participate in the creation of the Partitura Project. Since then they have performed together at many of the world’s leading festivals and venues. This disc is Julien’s debut recording. Chopin composed both his Preludes, op.28, and the Second Piano Sonata, op.35, in the years 1838–39, which also saw the start of his relationship with the writer George Sand and their infamous winter sojourn in Majorca. A time where the mood changed from happiness to great tension in their relationship, his health worsened, doctors attended him: "One told me I was going to die, the next that I was dying, and the last that I was already dead"; and the weather changed from warm sun to cold, relentless rain. Many changing moods are reflected in the Preludes.